Contains profanity and speculation based on things I think I know about future episodes, quite a bit of griping about spoilers at the end. 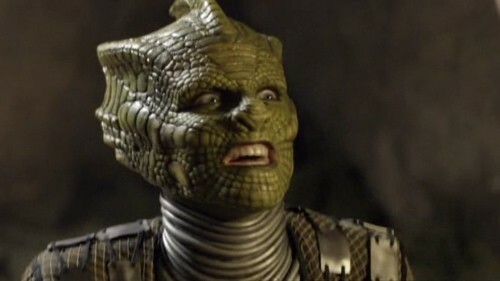 Previously on Doctor Who, the Earth was eating people who were far too doomed not to get eaten, and there were Silurians. 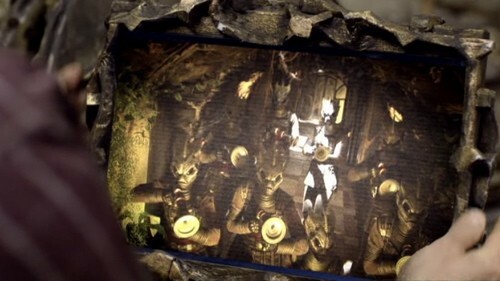 Rory is above ground with a Silurian scout-woman and some doomed people, everyone else is underground, Amy might get vivisected, no idea what they're doing with the adorable child, and the Doctor is admiring the Silurian city with the red shirt spontaneous applauding woman who is so very doomed. Doom! Right, I think that covers it. Well, except for the bit in the previouslies where that random encounter with their future selves waving frantically at them was repeated in an entirely not-significant-at-all way. But I'm sure that won't be relevant by the Series Five finale at ALL. Really. Not in the slightest. -"Of the day a thousand years past when we came to share it with a race known as humanity." Just a thousand years? That doesn't seem nearly long enough ago. Humans have been around a lot longer than that. 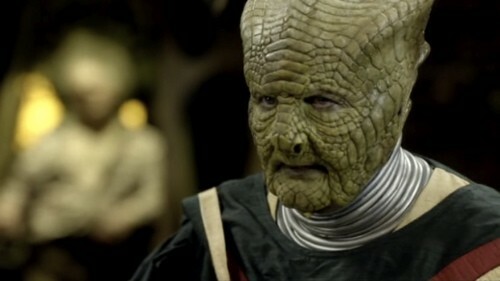 At that rate there would have been Silurians at the Battle of Hastings. But maybe this is a historical voice-over-guy and not a current voice-over-guy. 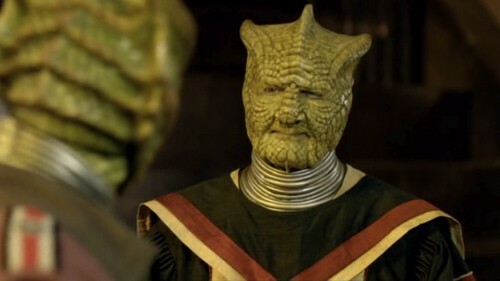 Or maybe Silurian years are inexplicably several hundred times as long as human years, despite having the same planetary rhythms to base it on. -"Looking for heat signature anomalies." Good luck with that; you're walking over lava. Still, it's all very pretty. -"Front door approach, always the best way. "/::Hostile life-forms detected. :: Yes. Eleven. Not much clue what he's doing, but he's improvising with tremendous determination. -"From the clothing, the human female appears to be more resistant to the cold than the male. "/"I dressed for RIO!" Bwahahahahaha! -Oh crap. Yeah. 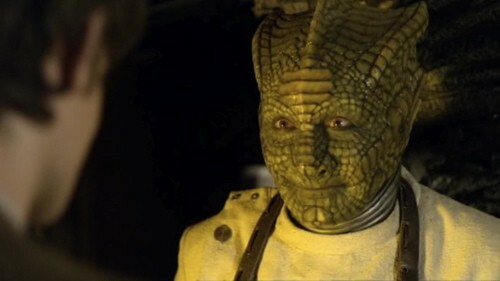 Dad's not going to be in any kind of mood to talk reasonably with the Silurians after seeing adorable child in a... what, cryogenic chamber? Cold storage? Hard to say. Things just got more prickly. -Excellent points from Amy on Elliot still being alive, and of course the dad's response is 'let's get weapons and make them release him', as any parent's would be, I think. 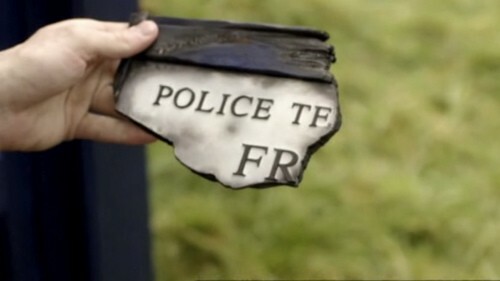 -"You told us you were the police." Did he? 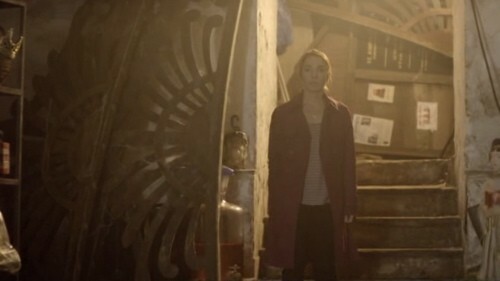 I thought it was more her and the kid assuming Rory was the police based on him stepping out of a box marked 'Police' that wasn't there before. Not that he argued with them about it much, but he was trying to get information at the time, and letting the talkative locals assume things was the most expedient method of data collection. 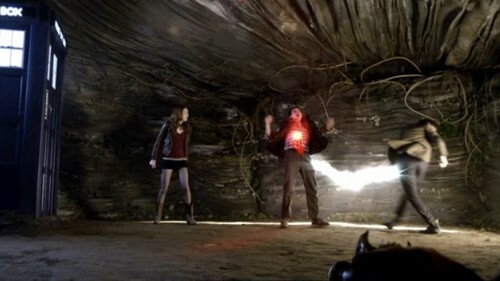 -I don't know if I've said this before, but Rory is kind of awesome. Him and his ridiculous puffy jacket. -Ooo! 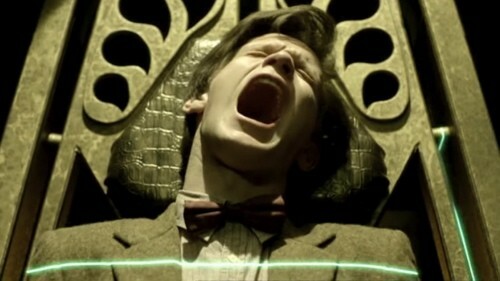 Eleven gets to scream, yay! Er. I mean, 'oh dear'. 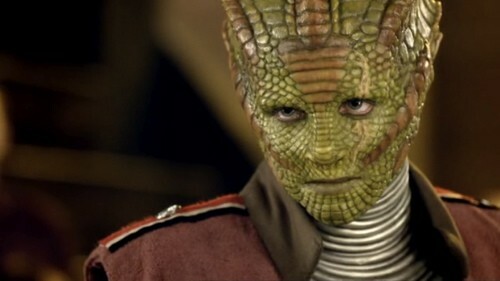 -Apparently the poison isn't turning him murderous, but the Silurian scout really isn't helping keep him that way. -"Not got any celery have you?" EEEEEEHEHEHEHEHE. Nice touchback to Fifth Doctor. More than just an allergen detector, then. 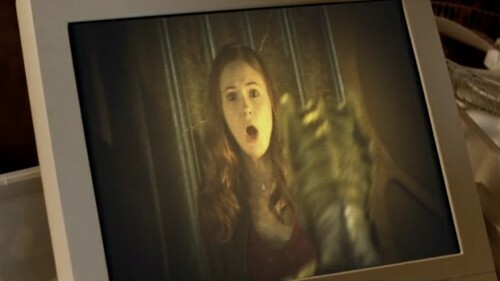 -"Ohhhhh, a green man." 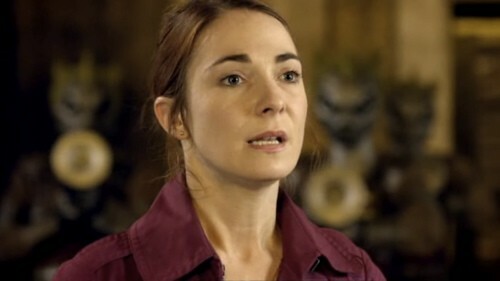 I will say one thing for Ms. Red Shirt, she's got some decent unfazeability to her. -"Your execution." Ah, well, he's been threatened with a few of those before, he'll be fine. -Sleeping in full armour can't be comfortable. Not to mention waking up with a thing pressed over one's face isn't a pleasant way to wake up, even if it is just a battle mask. -Ahahahahaha. Launch tubes! 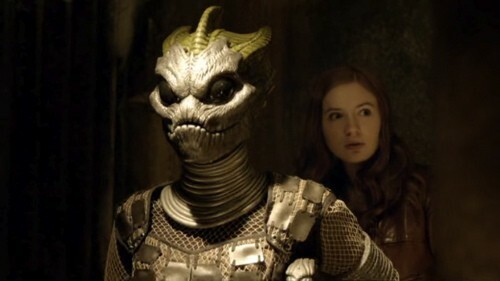 That's the way they wake you up in the Silurian military! 'Good morning! It's mission time!' Fwoooosh! Hahahhaha! ...actually, I could do with a launch tube myself most mornings. -"Even better, weapons." Yep. Human parent with imperiled child. Never mind escaping, just wave dangerous things around and shout until someone gives your kid back. 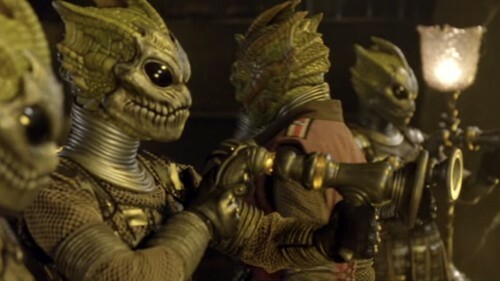 Not that it hasn't worked fine as a strategy for millennia, but a roving pack of armed humans in the Silurian city is not going to help the whole 'imminent war' thing. -Tell me those weapons aren't the legs off a coffee table. Or giant pepper mills. Because they sure look like that. -Ooo. Yeah. They're a little prepared to start some serious crap. 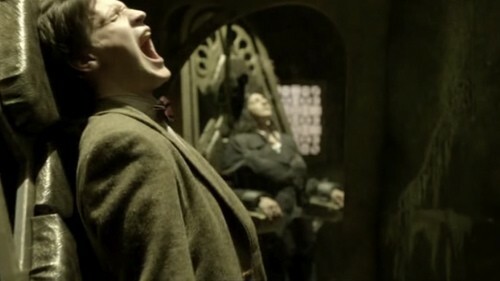 -Ahhhh, crap. Ambrose is the one that's going to kill the hostage. 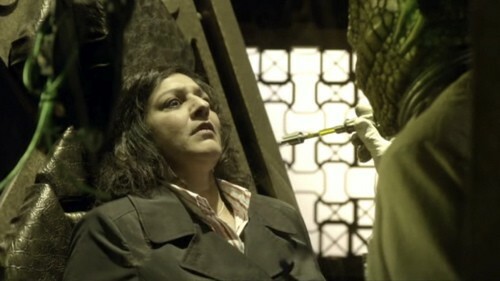 Her son and husband are down below, and she's about to find out her dad's dying of slow poisoning from Ms. Smirky Lizard, who will poke at her when confronted. Yep. Imperil her entire family. Crap. -"Humans attacked them and they died." 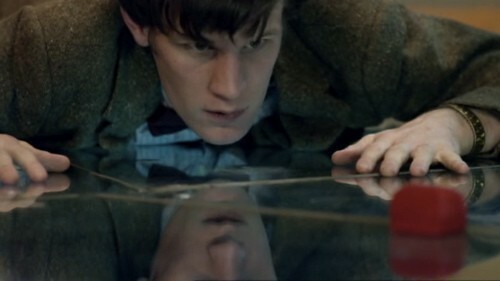 ...yeeeeah, not helping your cause there, Eleven. -Could you 'hide' the weapon behind your back in any more obvious a manner there, dear? Now we come to the 'Silurian scout attempts to taunt herself to death' portion of the evening, correct? -'First my son, now my dad.' Heh. Sorry spouse and father of adorable child, apparently you don't get a spare thought. -Well, if taunting doesn't work, coming right up on the inexperienced person holding the weapon might do the trick. 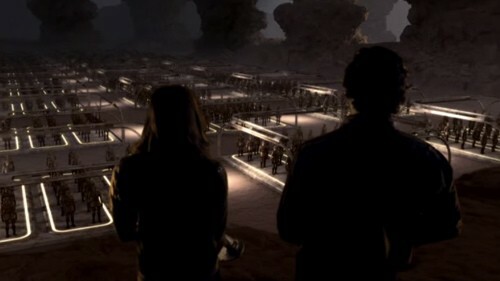 -"The one with the most to lose, the weakest."/Zot. And then taunting works after all. -"How do we help you, tell us what to do." 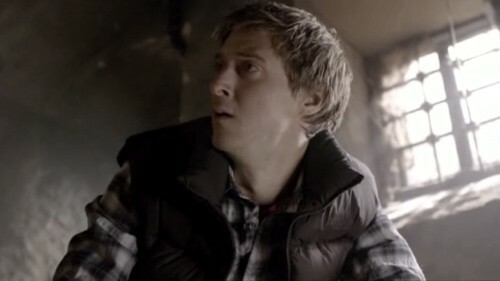 Oh Rory. -Set design. OMG. 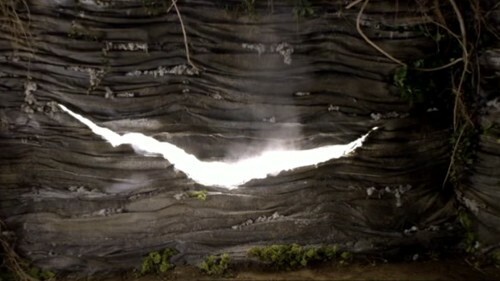 Set design rocks. -Oh dear, and now there's Amy with a gun, and father of adorable child with a gun, and everything's going to go straight to hell, isn't it? -Yep. "As rescues go it didn't live up to it's potential." Don't worry Amy, he's had worse. -"After they've wiped out the human race. *smile*" Maybe it's not unfazeability, maybe it's just a stunning failure to grip reality. Either way, her doom clock is still ticking. -Seriously, table legs, I swear. Not that that's a bad thing. There's a great many common household objects that would make great sci-fi props if they were spray-painted and had handles and whatnot sculpey'd on. 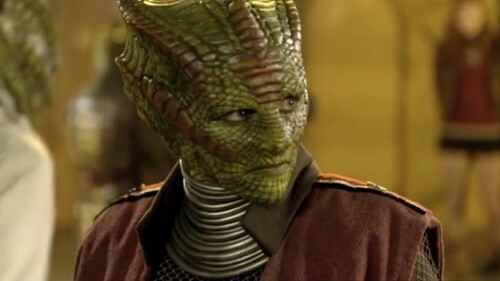 -Also, bit of a statistical anomaly, but all the warriors we've seen for the Silurians have been female, or at least bear a mammalian appearance of being female. No idea what that might mean for reptilian peoples. -"What happens now?" Doom. 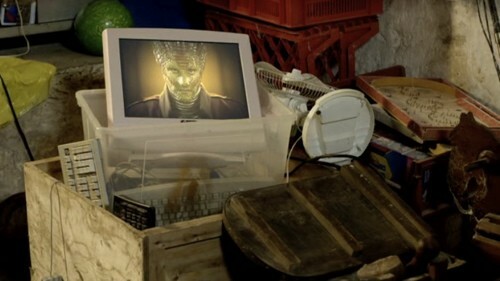 More specifically, Silurians activate busted monitors with no speakers to communicate with you. Or let you watch the executions or something. How are they even doing that?? -"Don't tell them what's happened." 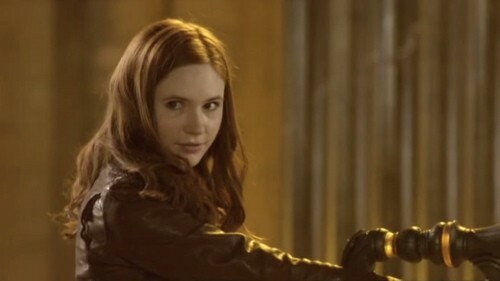 Rory. First a CID Inspector, now Speaker for the Apes. Yes. And lying about your dead captive is going to help so much. Really, it will. -"Do you understand who we are? "/"Sort of. A bit. Not really." Heeeee! 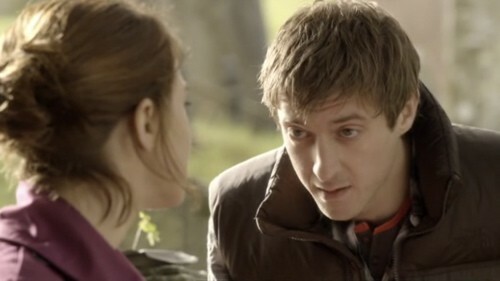 I like Rory. 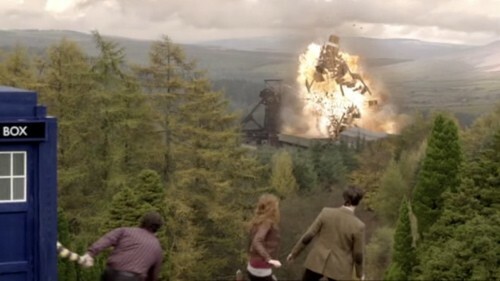 Poor doomed Rory. 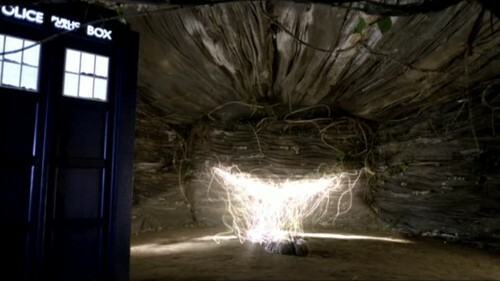 -"Amy, I thought I'd lost you!"? "What, 'cause I was sucked into the ground? You're so clingy." BWAH!!! -"Show me Aleah." DOOOOOOOOOOOOOOOOOOOOOOOM. No propping her up with a stick, either. So doomed. -"We're not doing what you say anymore." *facepalm* Seriously dear, you've done enough damage already. -"Execute the girl." Of course. Why not. 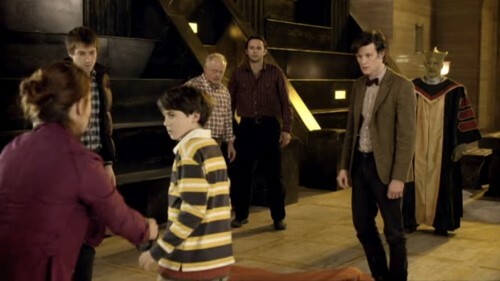 Except she won't get killed and it'll either be the red shirt or the dad. -Aaaaaand static. You know, if they wanted to induce panic in the people above ground, that would be damned effective. Probably more effective then actually executing someone. -Except it's the vivisectionist to the rescue! Not often you hear that. -Oh dear. It's the wise leader versus the genocidal warhawk. And he's baiting her. This is going to get nasty. -And angst and plotting is afoot on the surface. -"You're safe now. "/"Where are we?" hundreds of meters below the earths surface, in the middle of a city of lizard-people primed for war. Safe as houses. 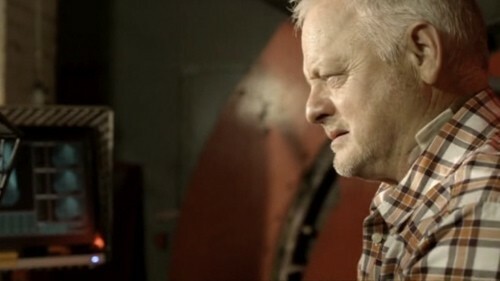 -"I've got to be honest with you son, we're in the center of the Earth, and there are lizard-men." What kid hasn't wished their parent would say something like that to them at some point? -Oh crap. 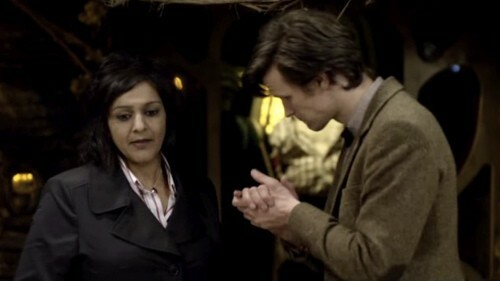 She's asked him to do something with the drill, hasn't she? -She's doing rather well at this being an ambassador for the humans thing. A bit narrow-sighted, but that will be fixable. Just in time for everything to go to hell. -"Transport has returned." Oh crap. And here comes the doom. -Heh. Yep. Can't have a military coup without waking up the military. 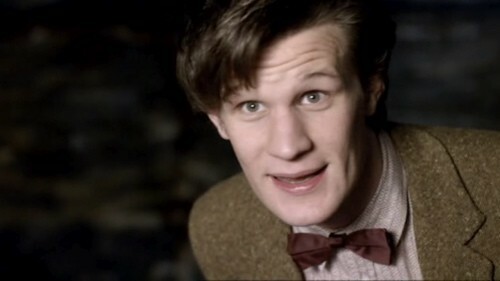 And our adorable-creepy vivisectionist is going to die now isn't he? 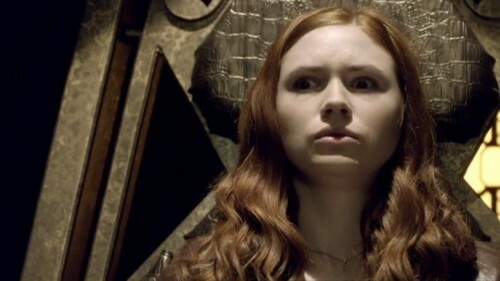 -I'm not sure if this is Eleven's "Oh crap" face or not, but it is pretty close. 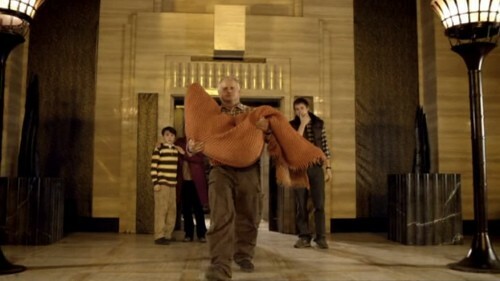 -Sure, make the old guy with the poisoned shoulder carry the corpse. Yeesh. He's not doing too bad at it though. -"I just wanted you back." 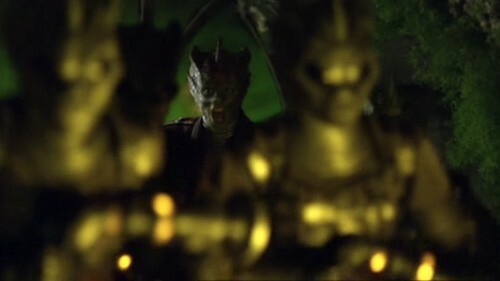 Yeah, I don't think that's going to happen whether the Silurians let you all back up to the surface or not. 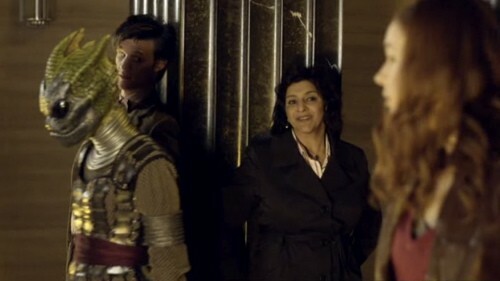 'Hi son, I killed a person and possibly started a inter-species war because of you.' Um. No. That's gonna need more than a pony to get over. -"This is our planet!" Dude, Shut. Up. You are totally not helping in any way right now. 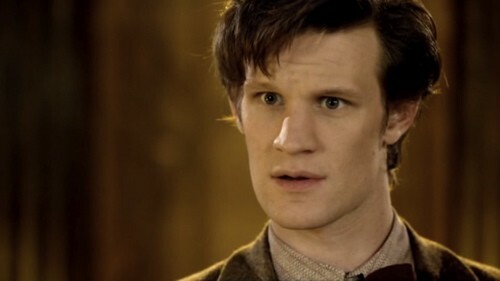 -Or maybe this is Eleven's "Oh crap" face. 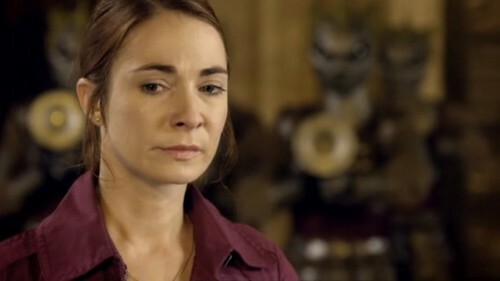 -This is definitely her "I am so screwed" face. -Aaaaand this would be her "I'mma eat you, human moron who killed my sister" face. -"This is a deadly weapon, stay back!" But it's not a banana. There's meta in here about Eleven and weapons. 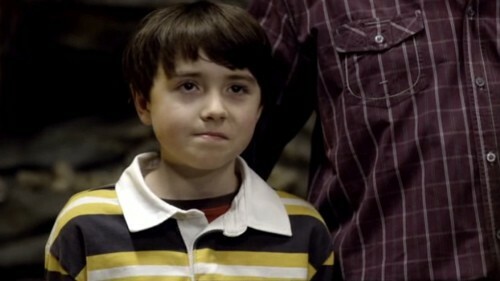 He didn't say a thing about Amy showing up with a gun, but he made Elliot's mom put the cricket bats away. Hm. 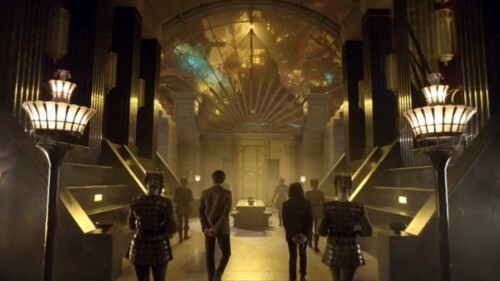 -Pretty, pretty set design. Or props. Whichever, it's pretty. 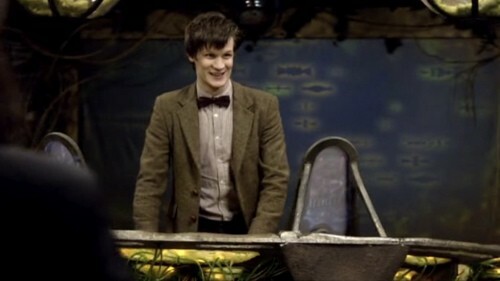 -"A shed-load of those creatures coming our way." Shed-load? Is that this program's "bullcrap"? If not, that's an awfully big shed. -I'm really starting to like, what's her name, Nasreen? She has sense. 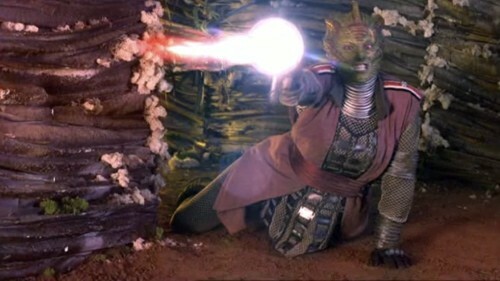 When the choice is protecting her life's work versus stopping the destruction of a city of already really annoyed Silurians, the answer is to kill the drill. Of course, the more I like her, the more she's dead. But she has shown surprising longevity to this point. -"The Earth isn't ready for us to return yet." A very wise leader indeed. 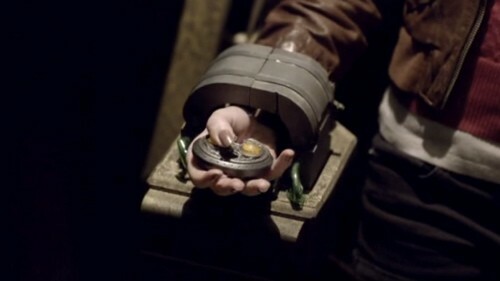 -"Set your alarm for a thousand years time." Ahhh, that's where the voiceover comes in. Somehow. So. A thousand years would be the year 3020, and... wasn't that around the time there was some bad thing happening to the Earth and that whole Star Whale thing happened? Um. Not such a great time to be trying to negotiate planet-sharing then. 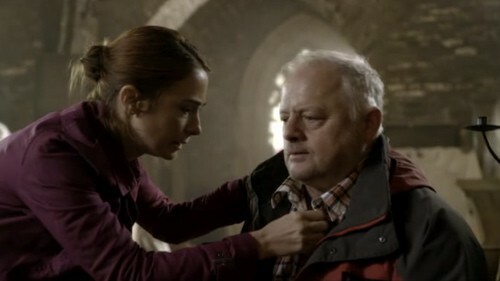 -And of course grandad's staying. 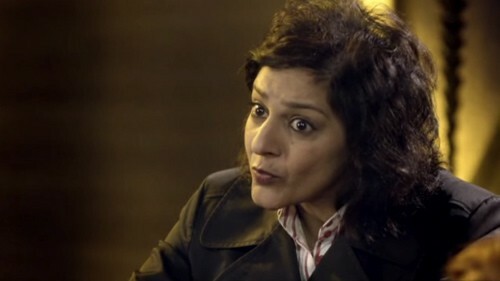 And so Nasreen's probably staying too. 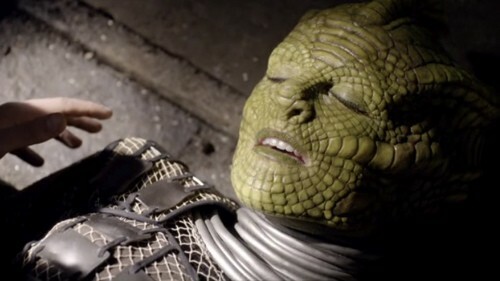 She still might die though, several minutes to go and a slew of warrior Silurians with no sense of self-preservation outside, and, like 5 minutes left before the gas thing. -Ahahahahaha. Well, looks like your warriors aren't as zealous as you are, honey. -"I'm not coming either." Yep. She's blowing up her life's work and not too bad at the ambassador gig, and her snuggle-buddy is gonna be in detox for a thousand years. Hopefully she won't get shot in the next few minutes. 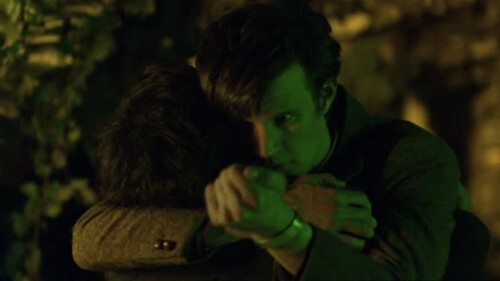 -Yes, hugs are great and all, but not blowing up or getting killed by toxic gas is slightly better. -"Other way, idiot!" Dude. 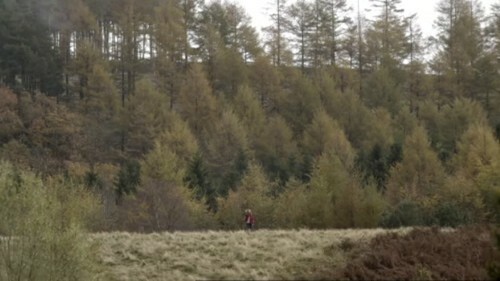 He was coming back to find out where you'd got to and possibly help you out. Yeeeeeesh. 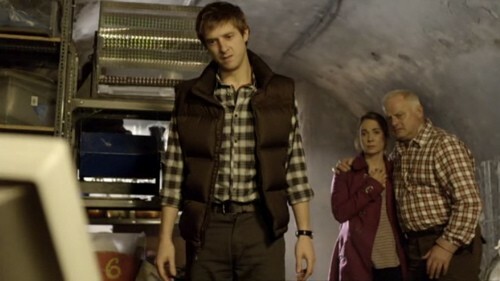 Poor Rory. -OH CRAP. Crack. Right. This. Dammit, I'm pretty sure I know what happens here. Oh god. Poor Rory. -"Everybody knows except me." Yeah, there's a whole three minutes till you all blow up or get poisoned or whatever, plenty of time to poke around in the big shiny dangerous time-nomming thing. -"Where there's an explosion, there's shrapnel!" Oh crap. 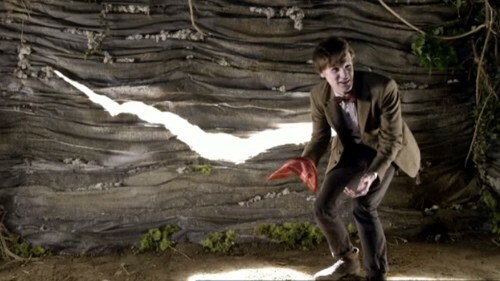 Just tackle him and throw him into the Tardis. 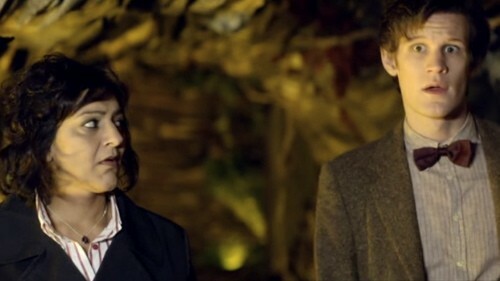 There's two of you, and while Eleven's not the narrow fellow Ten was, he's hardly a giant. Get him! -"You can't put your hand in there! "/"Why not?" 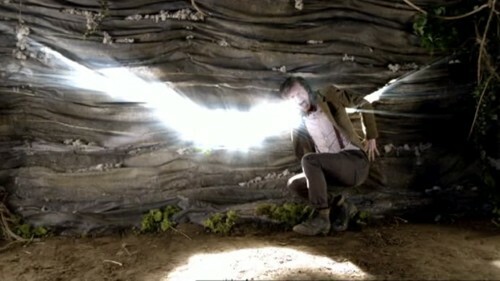 *facepalm* Eleven's gone nuts. -"I don't know." Well then. That was totally worth it. How much time is left? -Oh crap, this is it. -"I don't understand. We were on the hill." Yep. It's called spoilers, and I've seen them too. Dammit. -See if I didn't know the spoilers, I'd be pretty devastated at this point and not paying any attention at all to the countdown that's progressing rapidly onward. 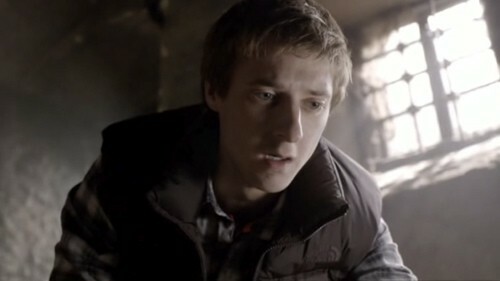 Seriously, grab Rory, haul him into the Tardis, say your tearful goodbyes in there. Or don't! 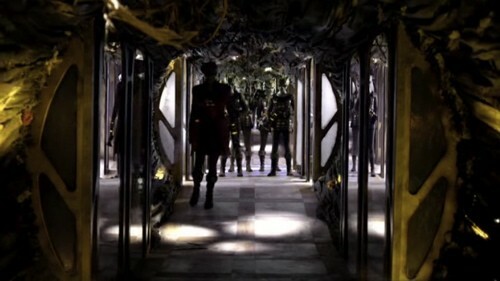 It's got a bloody Gallifreyan tech sickbay! 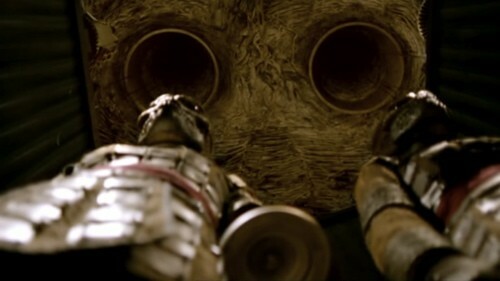 A shot to the chest from a Silurian blaster's probably no worse than a broken arm if you tune the Gallifreyan technomagicalhealing thingammies right! 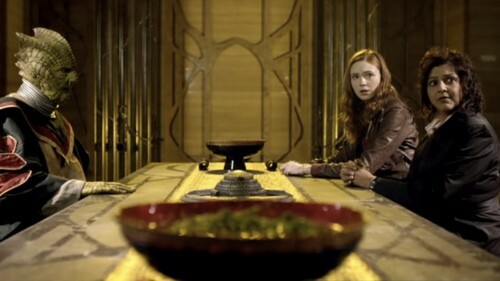 -Yes, well, there's the ring box, so some part of Rory is still around or that wouldn't exist, would it. 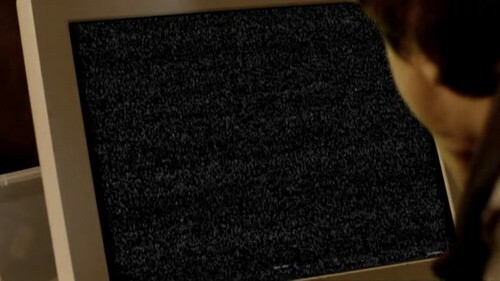 I am so annoyed that I know spoilers part this point, because that box would have had me freaking the hell out right now. But that's what I get for watching this series for the first time over fifteen months after the initial airdate. Sigh. -Ooo, big thing go boom. 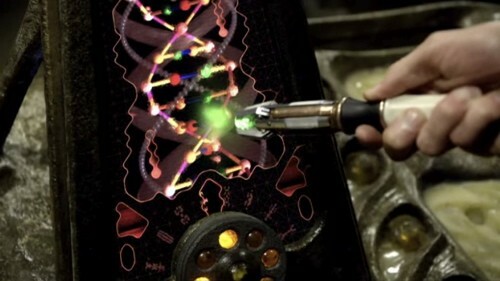 The Doctor is rather hard on mining operations. -"Hello, Me!" Yep. And yet it's still so very random that it can't be anything but random sight-seeing. Ha. Ha ha ha. 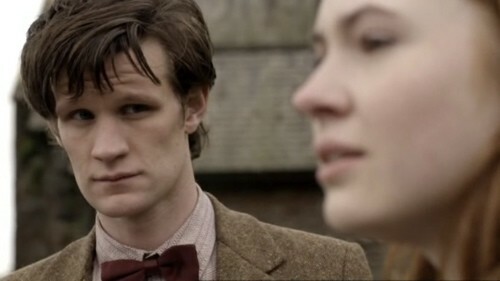 -This is Eleven, not quite buying Amy's line of crap. Or something. -"I thought I saw someone else there for a second." Okay, maybe a bit of fugue too. 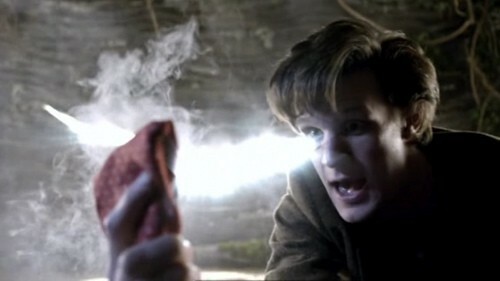 -Oooooo, what is it, what is it??? 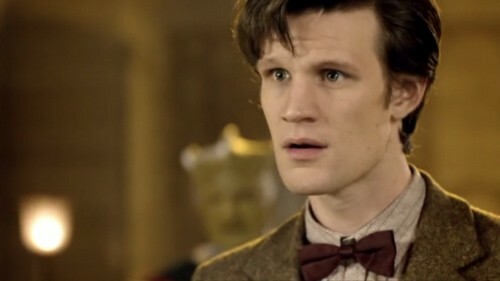 -Okay, fine, I'd been spoiled for that happening too, but still, *gasp*. Although really, if you go back to the 1960's there's boat-loads of Police Call Boxes that might have gotten time-nommed and/or exploded. Ha. Sure. Like that would happen. That was fun. As always. Did a hermit day today and i am up late as tomorrow is my Sunday. Wish i could comment about future stuff but no can do. Though there has been a study done about spoilers and it was found that no real harm is done by spoiling things :) Won't send the link as it is more a personal thing that people have about spoilers, i think. I saw that and almost signed up with an account at that site just so I could freak out in commets at the author. What an absolute idiot. Yes, I was, in fact, really really unhappy with this episode ending when I saw it, the day after it aired in the UK, and totally unspoiled. I might have rolled my eyes at the shrapnel, though. Yeeaaaah the shrapnel was a little contrived. Also how do you stick your arm in the Crack and not get time-nommed? Arg. Considering how attached I was getting to Rory, if I hadn't known about this event and other things, I would have been a frothing wreck. He's adorable! Getting attached to him cannot be helped. But, yeah, I suspect those spoilers would have been quite difficult to avoid. Hee! These recaps are quite fun. And I just got up to this point in my pre-season 6.5 rewatch, too. This show is particularly bad for getting spoiled on, considering how much of the plot is puzzle and arcs of plot development. And TWoP is a plague of spoilers. I used to be quite active there in the Supernatural forums, but yeah. I have to say, I've been enjoying re-watching this series through your eyes. 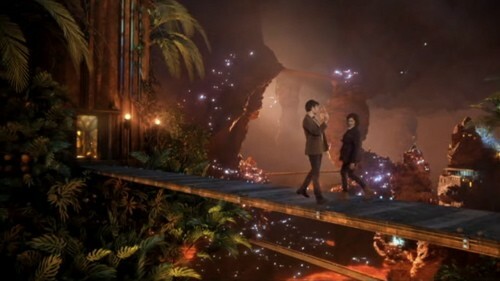 I wasn't impressed with this two-parter when it aired--it's possible it was my least favorite episode arc of the season--but you're right that it does have a lot of GASP moments in it, which, when you weren't quite sure where the series was going, were kind of amazing.